According to cannabis history, Blueberry was created back in the 1970s when a passionate breeder from the US combined several exotic landraces. The amazing result of these breeding efforts, for some one of the tastiest strains ever created, quickly took the cannabis scene by storm where she set out to win one cannabis award after the other. For Zambeza it was just logical to create a no-less-spectacular autoflowering variant of Blueberry for all those who love autoflowers for their convenience and easiness. Blueberry Auto shines with the typical short life-cycle for an auto of only 55-65 days from seed to harvest where she can produce a respectable up to 350g/m² if you grow her indoors. Another benefit of growing her is her compact size. Her short and bushy growth of 60-90cm indoors makes her a good choice to grow even in some tighter spaces. She won’t get much taller if you grow her outdoors. There she will reach a maximum height of 100cm with yields of up to 130g per plant if you make sure that she gets plenty of sun. Her compact size makes Blueberry also a good choice for stealth grows - ideal if you want to keep your grow hidden and under the radar. If you smoke this top indica, you will be delighted by her amazingly sweet and fruity berry aroma. Don’t be surprised if you find it difficult to put her down once you take your first hit of berry awesomeness! But aside from her spectacular taste, her effect won’t disappoint either. She is not a super-strong strain given that she has a moderate 14% of THC but she will make for a very pleasant, mild relaxation that gets more intense the more you smoke until she’ll give you a deeply relaxing stone. Her aroma and high make Blueberry a great smoke that you can enjoy any time of the day. 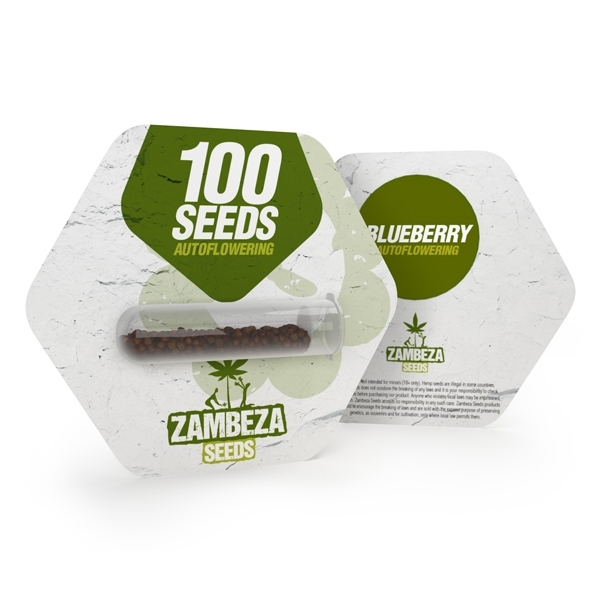 With Blueberry Autoflowering by Zambeza, everyone can now grow the amazing Blueberry without a fuss even if they have little or no experience with growing. 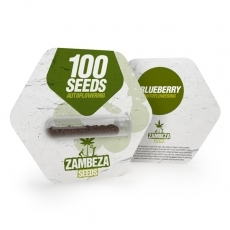 Zambeza offers Blueberry Autoflowering bulk seeds in packs of 100 seeds so that you can stock up on this rewarding and very tasty autoflower!